Jusuf Vrioni (1916-2001) was born on Corfu, the scion of an old aristocratic family of central Albania. He spent most of his early years from 1923 in Paris,where his father, Iljaz bey Vrioni (1882-1932), former prime minister of Albania, served for a time as ambassador. On 5 August 1939, he returned to Italian-occupied Albania for what he had envisaged as a short visit, but his plans were altered by the outbreak of World War II. Later that year he moved to Rome, where his brother had been offered a job with the Italian Ministry of Foreign Affairs, but returned to Tirana in August 1943 - to his subsequent regret. On 13 September 1947, during the political hysteria and witch hunts under Koçi Xoxe (1917-1949), Vrioni was arrested and accused of spying for France and of playing tennis. He spent fourteen months, from February 1949 to April 1950, locked up in one of the infamous seventeen "cells of Koçi Xoxe" which were 1.20 x 0.90 metres in size. In July 1950, he was sentenced to fifteen years of prison and hard labour, part of which sentence he served in the notorious Burrel camp. He was released at the end of 1958 and, after a period of internal exile in Fier, began working as a literary translator. Among his early translations, from Albanian into French, was "The General of the Dead Army" by Ismail Kadare, which was subsequently published in Paris. It was not until 1980, however, that his name ever appeared in a book as the translator. Although much of his time was taken up with translating and revising the political texts of communist leader Enver Hoxha, he found time to translate other novels by Kadare. These books, thanks to Vrioni's elegant quill, proved to be successful abroad. By the end of the dictatorship, Jusuf Vrioni had gained a reputation in Albanian intellectual circles as the most gifted translator in the country. 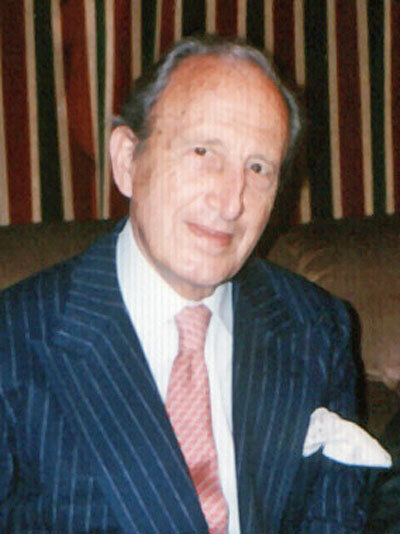 In 1997, after the fall of the regime, he moved back to his beloved Paris, where he was appointed Albania's ambassador to UNESCO and was made a knight of the French Légion d'Honneur. His memoirs, from which we offer an extract here, were published in French in 1998. I returned to Tirana with my mother in mid-summer 1943. As she had sold the house in Tirana, we set up residence at Hotel Dajti where we were to live for almost a year. This hotel, with its Mussolini-era architecture, had just been constructed and was run by the Italians. It was the establishment where, after the war, the Italian officers created by Ismail Kadare as characters for his first novel The General of the Dead Army were to reside, a novel which I feverishly translated into French a few years after my release from the labour camps. In the communist period, the Dajti was the meeting place for official guests of the regime and the nomenklatura. From the window of my room I spent a good deal of my time observing the Grand Boulevard lined with mimosa trees. The presence of the Italians had changed the town substantially over the last four years. It had become a lively little city, bustling with trade and commerce. Italian architects had completely transformed certain neighbourhoods, constructing the headquarters of the Fascio at the end of the Grand Boulevard - now called Boulevard Mussolini - and changing the sites for the ministries. Yet, Tirana still retained its oriental charm, with the maze of one-storey buildings in the old bazaar right across from the Haxhi Et'hem Bey Mosque. 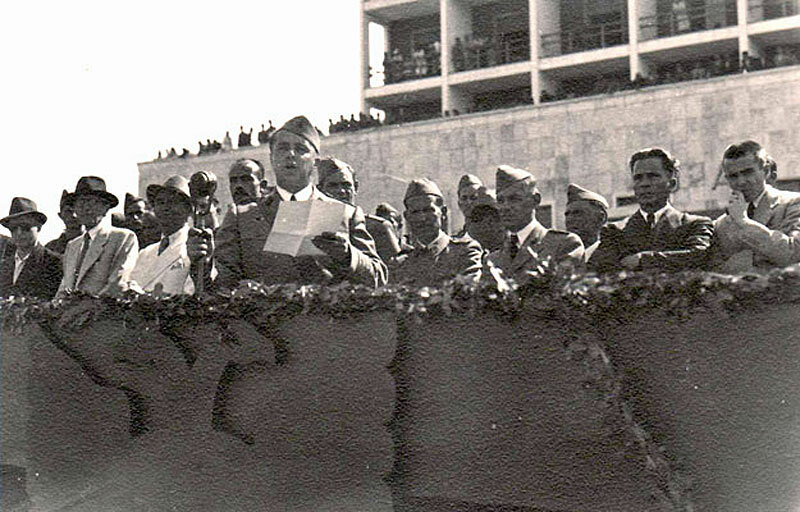 Enver Hoxha speaking in front of Hotel Dajti in Tirana, 10 July 1945. The situation remained fluid, and the Italian capitulation on 8 September changed things substantially. Many people were surprised that I had come back voluntarily to throw myself, as it were, into the jaws of the lion. When my plane took off from Brindisi on 4 August, American guns were battering Calabria, and the Wehrmacht was still fighting in Russia. It was impossible to predict that the communists would one day gain the upper hand over their many rivals in Albania. At the time of the capitulation, Albania was still occupied by Italian troops, but everyone was aware of the rise of a resistance movement, i.e. of the National Liberation Front, whose fighters wore a red star on their caps. We had also heard of the Balli Kombëtar (National Front) which was headed by renowned figures such as Mid'hat Frashëri and Hasan Dosti. A few weeks after my return, the Legality Movement was founded under Abaz Kupi, a one-time high-ranking officer of King Zog. His organisation supported the return of the king and the re-establishment of the "legality" which had been done away with by the occupiers. The Zogist movement had called its coup d'état of December 1924 the "victory of legality," a slogan to be found on the postage stamps of the period. After the Italian capitulation and the takeover of Albania by the German army which arrived at the last moment, so to speak, to replace Italian forces, Hotel Dajti once again became the focal point of clandestine meetings and political contacts. Within a few weeks' time, it was being frequented by non-communist "outlaws" who were allegedly living underground, but who profited from the tacit truce with the Germans with whom they were supposed to be fighting, by coming down from the mountains and staying there for a while to make their contacts. The hotel was a giant beehive of activity. They arrived bearing machine-guns that they placed cocked on the tables, their hands never far from the triggers. It was a very oriental atmosphere, but also had something of the back room of a Western saloon about it. I knew the head waiter at the Dajti, as I had happened to meet him in the winter of 1940-1941 in Sestriere when he was working at the Hotel dei Duchi. He was a gentleman and was used to serving clientele at better establishments. I was surprised to have met him there. In the two or three months during which he continued to work at the Dajti before being repatriated, this quiet fellow was a mirror of the profound contradiction within me - between my former life reflected by his presence, and the new life I was slowly embarking upon without really understanding how radically different it would be. I observed him as he shuttled between the tables and the guests, terrified at the sight of the machine-guns. One day, unable to put up with the behaviour of the new guests, he whispered to me: "Signore, how appalling!" The first step that my cousin Aziz and I took was to make contact with the Balli Kombëtar. But the men whom we contacted showed a certain reluctance towards us. They did not seem to want to burden their ranks with too many representatives of the class of beys. We were slightly offended by their attitude and adopted a more reserved stance towards them. At that time, the various resistance movements had agreed upon a pact at Mukja to define the scope of their concerted action against the occupiers. But a few days later, the Comintern, having learned of the terms and conditions of the pact, declared its open opposition to it and set up the National Liberation Front (NLF). The NLF thus proclaimed that its representatives at Mukja had purely and simply betrayed the movement. As such, the resistance movement split into two branches, one which had declared open war and the other which manoeuvred in the underground and tried not to come into open conflict with the occupiers. In Tirana, we continued observing and calculating. Some of our hypotheses were confirmed and others invalidated by what we learned of underground diplomatic manoeuvring. The "Western-oriented" democratic forces stored all their hopes in a would-be Allied landing. A landing! How often this word was pronounced and bandied about! Even in 1945, some officers of the British mission in Albania still believed or wanted to believe that the war had changed Russia and that the regions it had liberated would be allowed to install democracy. It is perhaps of interest here to provide an overview of the currents of Albanian public opinion at the time. The Balli Kombëtar was a nationalist movement that adopted the motto "Albania for the Albanians" and strove for a greater ethnic Albania including Kosova and Chameria (in northwestern Greece). The greatest resistance to the occupiers was shown by the National Liberation Front. It endeavoured to assemble not only the communists but also a good portion of other patriotic and progressive forces. The period from the Italian capitulation to the liberation was marked by a change in the balance of forces within the country. The communists spread their influence in the mountains, taking advantage of the term National Liberation Front. Their movement was one of iron discipline and moral rigidity, and attracted an important fringe element of the population. They were mostly young people, including many young girls, who were camping out in the mountains. Their relations gave rise to much comment among the Albanians who were quite intransigent in matters of public morality. It was imagined that the young girls in the mountains would be having intimate relations with their comrades-in-arms. As it turned out from what we gradually learned, the partisans had extremely severe views on matters of morals. Whenever sexual relations between a young man and a young woman in the movement were uncovered, the couple was simply executed. There was no trifling with love among the partisans. This, however, did not stop future couples like Enver and Nexhmije Hoxha from tying the knot during this period. My stay in Tirana was marked in 1944 by a very peculiar meeting, that with the direct great-granddaughter of Abdul Hamid, one of the last sultans of the Ottoman Empire who was reputed for his rigor and despotism. This young woman, with an attractive oriental face, had arrived in Albania hoping to get back the estate of the pasha of the Bushati family, who was my grandmother's husband. Having been raised in France from an early age and living in Nice, she did not speak Albanian, but was able to express herself elegantly in French. She was a painter. Matisse, with whom she had been friends, was very fond of her. She showed me the letters she had received from him despite the difficulties of correspondence at the time. How old could she have been? I guess about thirty. My life at Hotel Dajti was that of an observer. Here again, I did not play an active role in events. I was later filled with regret at not having done this or that, but action was a complex matter. If, for example, one acted against the communist movement, one was virtually forced into a compromise with the occupation authorities. But how could I have joined the National Liberation Front, knowing perfectly well that it had been set up by the communists? Contacts with my brother and sister in Italy were reduced to almost nothing. Nonetheless, from time to time we managed to receive news of them from the few travellers coming back to Albania via Trieste and Yugoslavia, the latter of which was still in German hands. We thus knew that Ali was in good health and was living somewhere in Italy. We also learned that he was married to the young woman whom he had been seeing before my departure from Rome. Compared to what was going on in Europe, my life was uneventful. I lived in relative security, in a situation of passivity, tantamount to guilt. I visited several friends of mine who had studied abroad and, like me, were not politically active. We would meet on an almost daily basis to talk. There was no lack of subject matter. We met either at the only tennis club in the country or at a café in the town centre, called Sahati, at the foot of the bell-tower. Our wait-and-see attitude was thrown out of keel in early June when we heard of the Allied landing in Normandy. We no longer doubted how the war would end. You did not have to be too bright, even living in Albania, to realize that the Germans would react. It would have been absurd for them to fight so hard to maintain control of Crete and then let the Americans advance on Paris. In Albania, the communist partisans began attacking German forces more and more. The final months of the war in Albania saw the Front, dominated by the communists, get the upper hand over the other resistance movements. Several noted figures of the nationalist movement left Albania, though they were to be persuaded to return to the country six months later. My mother and I left Hotel Dajti just before the battle for Tirana began in November. The hotel would have been precisely on the frontline between the two opposing sides. Many important figures fled Hotel Dajti, some of them on German troop carriers, and others in private vehicles. There was no longer any possibility of our returning to our house in Berat, which we had left behind in perfect condition. It was being used as the headquarters of the new liberation government, and our wing of the building had been completely ransacked. I therefore moved with my mother and cousins into an apartment in the building which would later house the Korean Embassy, on Scanderbeg Street. It was thus in a neighbourhood of gardens and villas that we lived until the beginning of 1946. The government which was set up in Berat made its entry into Tirana on 29 November 1944. The year 1945 was a period of wait-and-see for Albania. The communists adopted a velvet-glove strategy. There was an atmosphere of tolerance in the air. In April, however, there was a major trial against collaborators which resulted in about twenty executions. There were also numerous summary executions of individuals accused of having spied on the resistance movement. Such events took place in an interim period of occupation, but behind the scenes, the secret police, called the People's Guards, were already operating under the direction of Party secretary, Koçi Xoxe. One day in March 1945, a partisan wearing a cap with a red star on it, knocked at my door and handed me a summons. I was to appear at the military headquarters in my neighbourhood. I was told that I was to be conscripted into the 16th Brigade. There was no point in trying to postpone things, so I set off to register. My unit had set up its headquarters in a part of the former royal palace of King Zog, later of King Victor-Emmanuel III, re-baptised Palace of the Brigades, in the wooded hills on the outskirts of the capital. This turned my world upside down, in particular because the unit I was assigned to was tasked with pursuing the German Army onto Yugoslav territory. I spent two nights at the brigade headquarters sleeping on the bare floor. It was incredibly filthy and infested with fleas. We waited day after day to depart for the north. Discipline at the Palace of the Brigades was lax and, since the floor I was sleeping on was not particularly comfortable, I managed, with the help of a friend of mine who had been conscripted too, to spend the following nights in the 'imperial bed' in which Victor Emmanuel, King of Italy and Emperor of Ethiopia, had slept during his visit to Tirana. Even bereft of its mattress, his majesty's bed was infinitely better as accommodation than the palace floors. But just before the fifth night, I was informed that I was to return to barracks. The restoration of discipline was a sign that our departure was imminent. I wondered what the coming days would bring and had difficulty imagining myself running about, with a red star on my cap, assisting Yugoslav partisans in their struggle, quite independent of whether or not their cause was just. Albania intended to support the Yugoslav partisans and chase the Germans from Kosova. Indeed, they were ready to chase them as far as the Vojvodina. I was not too enthusiastic at the prospects of being in a unit so far away from home. My only consolidation was the thought that Albanian society was now in a phase of evolution. A youth organisation had been created and, in the sports field, structures were being put into place to cement contacts with youth groups from other countries. A conference of the World Youth Council was to be held in London, and I had heard in Tirana that, since I had not been compromised by any ties to the occupation regime, I stood a good chance of being sent there as a delegate. As I subsequently learned, our government, keen on giving itself as liberal an image as possible, judged it ill-advised to present itself as a communist regime. It wanted to be seen in the eyes of the world as a government supported by all democratic forces in order to be recognised by the international community and thus become a member of the United Nations, which was to be founded in June of that year. It endeavoured to demonstrate that members of the social class who were theoretically opponents of communism supported the regime. I thus learned that representatives of the regime had mentioned my name in their conversations. I was not an 'important figure,' but I did stem from a well-known family and had studied abroad. Some people in the youth organisation made it known that using my services for translations would make a good impression. One day, while I was stuffing a bag with leaves to make myself a mattress, I heard the crier announce that I was to present myself at the command post. He ordered me to gather my clothes and report to the division's political commissariat, to an important person called Hysni Kapo, who was later to become the number two head of the regime. I scrambled into the wagon and set off for the office. Kapo received me kindly and spoke well of my father. I saw that he was well versed in the history of the "old regime," He told me that I was to join the Youth Organisation and devote myself to sports activities. I must admit that I do not recall many other situations that have given me such a great sense of relief. As such, the final days of the war were not too onerous for me. From time to time, I would meet a group of friends at the tennis club where I used to go to during the occupation. Some of them were optimistic. They believed that the Allies would never permit a communist regime on Italy's doorstep. For my part, I was less certain and wondered about the Allied attitude towards Tito. The day after my meeting with Hysni Kapo, I reported to the headquarters of the Union of Albanian Anti-Fascist Youth and met two members of the secretariat who had both asked for my services. Like a centaur, I was split into two functions: translating in the morning, and participating in sports activities (basketball and tennis) in the afternoon. Although they were still quite young, the members of the secretariat played an important role in the political movement. The general secretary, Nako Spiro, was obviously the number three of the Albanian communist movement. The members of the first secretariat of the Union of Youth would all come to play important roles in Albanian politics. Responsible for sports at the time was Niko Opari, with whom I later shared a cell after he was implicated in the "group of Koçi Xoxe." Also in the secretariat was Liri Belishova, whose name was later associated with the events of 1960, when she was unmasked as a member of the poor group of pro-Soviet leaders. The former mobilised me for sports and the latter for translation work. At the end of March 1945, our football team and two tennis players went to Belgrade. I spent about ten days in the Yugoslav capital which was still under curfew. I was surprised by the lingering presence of French influence in certain circles there. On a later visit to Belgrade in 1979, this influence seemed to have waned entirely in the wake of universal Americanisation. But in 1945, I found it all quite extraordinary, and could even detect French influence in the architecture there with all the five and six-storey buildings, and many of the streets resembled those in Paris. One could sense a flirtation with France in the atmosphere, and the country was particularly well regarded at the time. At the Franco-Serbian bookstore, I made friends with two sisters, one of whom, Liliana, promised to send me some volumes of Western literature to Tirana. She probably did so, but I never received them. Two years later, during interrogation, I was asked what links I had had with her because the Albanian regime was now certain she was a spy. I was asked about the books, as if they were anti-Albanian fire-brands. Life resumed its normal course after my return from Belgrade. In April, I had occasion to meet the representatives of the British, American and French military missions seconded to Tirana. We soon became friends, in particular because they saw us as people who were culturally and politically closer to them than most others. Among my new acquaintances was an Englishman called Wattrous, with whom I played doubles at the little tennis club in Tirana. One day in the summer of 1945, I ventured to invite him to lunch at the Hotel Continental. The chief judge of the Albanian military tribunal, a one-time pupil of the lycée in Korça, was in the restaurant at the time and stared at me repeatedly. I do not know how I had the courage to meet privately with an Englishman at such a venue! I imagined that my free-and-easy manner would serve to show the innocence of my intentions. But things were now viewed differently. A modest circle of social activity developed around the foreign missions. I attended several receptions organised by the American Military Liaison office. One particularly scatter-brained friend of mine had even managed to set up a Spider Hot Club, with a band that played tunes that the regime would ban a few months later. There was an atmosphere of G.I.s, of boogie-woogie and the jitterbug, as in the parts of Europe liberated by American troops. This little club constituted all the freedom there was in Albania at the time. I also made friends with a parachutist of the French mission, an officer called Cochet, to whom I revealed my fears for the future. He suggested one day that I get made up, put on a French uniform and leave the country via Durrës, as he was soon to embark for France. I was torn by the proposal. My mother was not opposed to my departure and even prepared a belt of gold coins that I could take with me when I left. She had resigned herself to the fact that I would soon leave Albania to escape the threat hovering over us. The danger became more and more concrete every day, even though we were still in the euphoria of victory in the summer of 1945. I often wonder, because such an operation involved real risks, whether it was simply cowardice that prevented me from leaving. But there were other, more dignified, reasons that held me back. Having been in contact with partisans who had risked their lives in the liberation of Albania, I wondered if the time had not come for young people of my social standing to take a few risks themselves and to do something for the democratic movement. If Cochet had made the offer two months later, when some of my illusions had dissipated, I would perhaps have accepted. So I decided to stay. But to do what? Set up a democratic movement? Many people dreamed of this, but no one was prepared to take the risks involved. We could rely on no one. We began to realise that, with the regime now firmly in the saddle, they could eliminate whomever they wanted with impunity. A simple word often sufficed to send someone to the gallows. There were certainly forms of passive resistance, but a Sakharov in Albania was unthinkable. He would have been suppressed within the first three or four "subversive" sentences. The menacing attitude of the authorities became more evident from 1946 onwards, after the elections of 2 December 1945. These elections were carefully prepared, and a certain account was taken of the opposition because the regime wanted to impress international opinion with the fact that our country was a democracy. Some groups, who had distanced themselves somewhat from the National Liberation Front, were trying to make a place for themselves in the political arena, though they were being watched, without knowing it, by the People's Guards. But a real opposition movement never crystallised. Their actions were reduced to a few contacts, conversations and preparations. This very vague opposition did not even have a name. I was convinced at the time, with a rashness I would later consider to have been excessive, that there was nothing concrete behind it all and that we adversaries of communism would soon have to take some risks. Most of the population was illiterate and, in view of this, the new government decided, for voting purposes, to use little balls that would be cast into the ballot-boxes. Each voter was to take a little ball with him into the booth and cast it either into the box for the Liberation Front or into the other box. Many people claimed that you could hear the difference in sound when the ball was plunked into the box, and they therefore knew if the person in question had voted properly. The Liberation Front had observers in all the polling stations and, because the voters' lists were strictly kept, it was not difficult for the People's Guards to find out how you had voted. Endeavouring to keep up a democratic appearance, the government even invited foreign observers into the country. Several dozen Western journalists arrived to monitor the elections, an event which was to mark a decisive turn in my fate. In this atmosphere of deceit and intrigue, we were of the opinion that something had to be done to inform the outside world of the realities of our Albanian 'democracy.' For a start, we contacted with a number of prominent figures such as Suad Asllani, Balthazar Benusi and Gjergj Kokoshi, hoping to set up a serious opposition. Yet despite much initial goodwill, none of them was willing to serve as spokesman for the movement. My friends and I were nonetheless convinced that the foreign journalists ought to be informed of what was going on. It was too dangerous to contact them directly. We therefore had to find a way of contacting them in secret. We decided to draft a memorandum. I was to be responsible for the French-language version, and the text was also translated into English. The memorandum painted a realistic picture of the situation and invited the journalists to verify the claims which were being made by the regime. All the sentences that I wrote began with the question: "Is it true that…?" We asked them to investigate one fundamental issue, i.e. whether there were any opinions in the country other than those of the National Liberation Front, and what were the reasons why these opinions were not reflected in the elections. We invited them to investigate the issue as to whether there was a Communist Party in Albania (it had not yet declared itself as such) and to find out what role it was playing. We appealed to them, in conclusion, to be aware of the cover-up that was taking place. Our document was signed: "Some genuine anti-Fascists." This was one of the reasons for my arrest two months later. As expected, the elections were won by the Democratic Front (the new name for the National Liberation Front). But if one looked more closely at the results, it was apparent that in Tirana, despite massive pressure, the Democratic Front had 'only' won 67% of the vote. The People's Guards sometimes succeeded in finding out who voted 'wrong', and the people in question gradually began paying the consequences. They initially lost their jobs and were then declared persona non grata in the capital and were sent into internment. Rumours began to spread in certain circles that a memorandum had been transmitted to foreigners by members of the families of the one-time beys. My mother and I still had enough money to live on because we were still receiving rent payments from tenants on our properties in Berat. We had no idea what was to come, and the situation at the time was not really as bad as one imagines it today. There was actually nothing to stop us from hoping that better days would dawn. For example, one member of our family received a permit from the Ministry of the Interior to leave the country. Mademoiselle Badel who had lived in Albania since the early 1930s was in close contact with Mrs Jacob, wife of the head of the American Mission. This step, which resulted in her name being put on the index, caused me much grief after my arrest because I had to explain the reasons that had compelled her to associate herself with the American lady. Obsessed by espionage, the regime could of course not comprehend that the old lady simply wanted to obtain a source of revenue to survive on! From early 1946 onwards we suddenly felt the thumbscrews turning, with a rapidity and savagery we had never imagined. The first waves of arrests took place of those who had been involved in democratisation projects. From leakages, we found out that people were being arrested for having 'conspired' against the regime as agents of imperialist forces. These were new accusations. As for me, I continued to try making myself useful to the Union of Anti-Fascist Youth. During a reception at Hotel Dajti the previous summer, I had met Fadil Paçrami, later to be a member of the Politburo, and Ramiz Alia, new secretary of the Youth Union. They spoke amicably of me, indeed with words of praise. This was at the time when they still wanted to have people of differing views in the organisation. Up until December 1945 at least, I was well regarded by the rising stars on the political scene: Alia, Paçrami and Liri Belishova. In addition to my translation work, I continued to devote myself to sports - tennis and, in particular, basketball. I, nonetheless, made it clear to my superior that after that period of tenure, I would probably be sent back to the army. I was the only support for my mother. He agreed and told me that I should use my time to try and find a job. Rumours continued to circulate. I knew that the regime was now using torture. Those were frightening months, with much cruelty and many summary executions. I had difficulty getting a job. I was looking for employment at the time when the campaign for class struggle was just getting underway. By 1946, the average man on the street had understood how perilous the smallest comment in public could be, in particular if he were of 'bourgeois' origin or had ties with foreigners. At that time the Union of Albanian Women was looking for someone to translate from French and English, and this notwithstanding, I applied for the job and got it. The president of the organisation, Nexhmije Hoxha, was more or less informed of the work that I had been doing. Among the texts which I translated for the wife of the Dictator were speeches she was to give abroad. Tension increased in Tirana. Deportations to the countryside and revocations of residence permits were becoming more and more frequent. My cousins were sent to Durrës. I learned that I had been an intended object to the same edict but, at the last moment, Enver Hoxha's wife insisted that my expulsion be put off because it would be difficult to replace me on the spur of the moment. I was thus still in Tirana at the end of 1946. A new agrarian reform was introduced that foresaw the confiscation of all of the assets of the one-time landowners. It replaced the first agrarian law which had been voted in a year earlier. The radio was now my only link to the countries of my childhood - France, England and Italy, and to the new world which had arisen since the war. I followed the goings-on at the United Nations with great interest. I lived glued to my radio - to several radio stations, including the BBC and French stations. In early 1947, my mother and I were forced to move because the house we were staying in was deemed to be too luxurious for us and was transformed into the Korean Embassy. I rented two rooms which were owned by an engineer. That is where I spent the year before my arrest. In May, my cousin Aziz, who had been exiled to Durrës, came to spend a couple of days in Tirana. He slept at our place. One night, at about two in the morning, a jeep stopped in front of our house. Four agents of the People's Guards got out and knocked on the door. I did not know if they were coming for Aziz or for me, or for the two of us. They searched the premises for about twenty minutes and then ordered my cousin to follow them. I was all alone. It was impossible to phone my relatives in Durrës in the middle of the night. Many of our friends were detained that fatal morning. The whole operation lasted three days. The People's Guards arrested about two hundred individuals. There was nothing in Aziz's past that justified his imprisonment. But the security forces were content with anything. In June it was the turn of one of my friends, Felatun Vila, with whom I had prepared the famous memorandum. I had confidence in him. There was no reason for him to give in, but the noose was getting tighter. Several members of parliament were detained in the course of that sorrowful spring. A large trial was announced in which some leading public figures were to be sentenced. Though not communists themselves, they had given their approval to the regime and thus made it more acceptable to certain strata of the population. These figures, having understood where the Stalinists were leading the country, began to whisper, expressing minor criticism and adopting a tone that the regime could not deal with at all - irony. It was during this trial one day that, joking around with a colleague, I said: "They mentioned your name in the trial proceedings." He turned as pale as a ghost. I should never have played the joke on him. Four days later, on the evening of Saturday, 13 September, while I was waiting on the main square for a girlfriend, it was my turn to hear the fatal words: "Are you Jusuf Vrioni? Would you please come along with us? We have a few questions to ask you."